Presenting poet Raymond Tyler reads his poem, "When You Remember," at the April in Paris: Evening of Spoken Words & Music showcase. 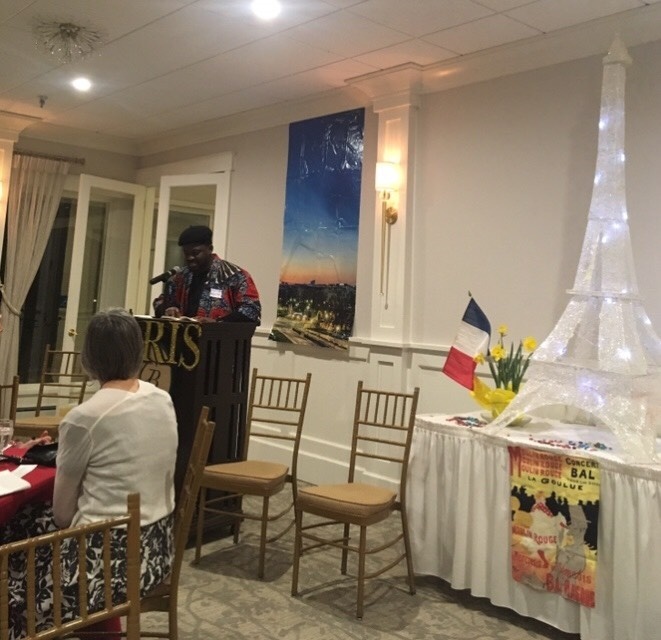 The Somers Point Arts Commission kicked off its fourth annual April in Paris event Wednesday with a poetry night titled “An Evening of Spoken Words & Music” at the Greate Bay Country Club in Somers Point. April in Paris is a week-long showcase featuring a variety of Paris and French-themed events including an art exhibition, wine tastings and even French lessons. 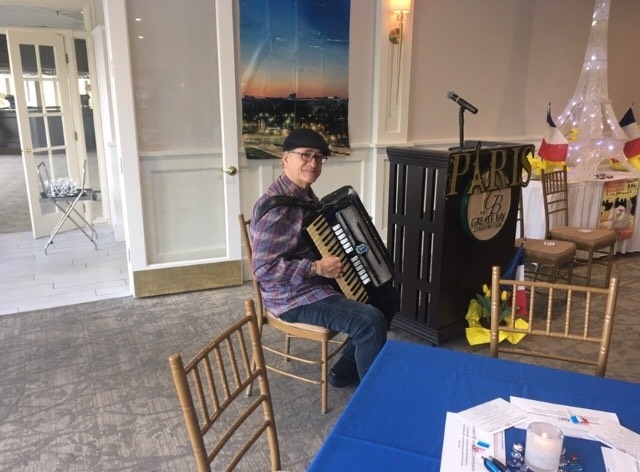 Accordionist Tony DeLuca serenades attendees as they arrive at the event. 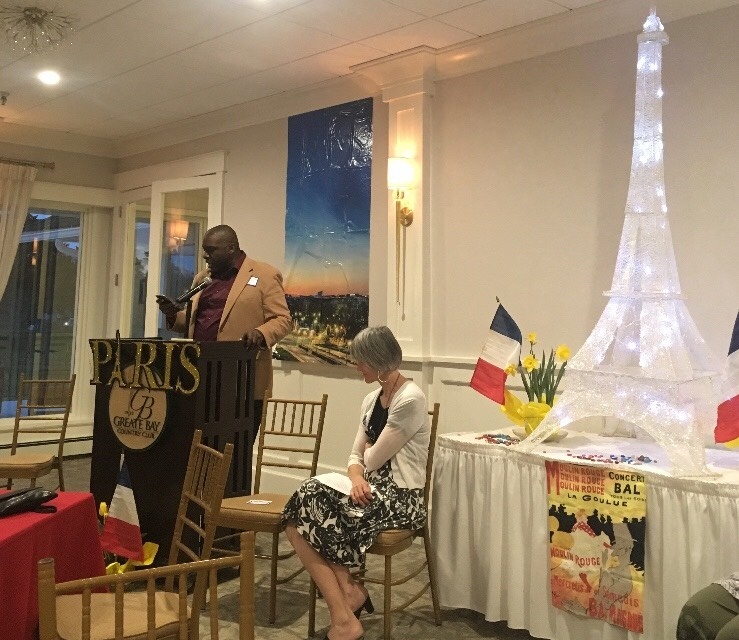 The evening began at 7 p.m. with artist Kathleen Arleth welcoming guests and giving a brief overview of the many Parisian-inspired activities the Somers Point Arts Commission has in store for the week. Arleth also showcased some of her work on Wednesday night along with fellow artists Michelle Collins and Chuck Law. 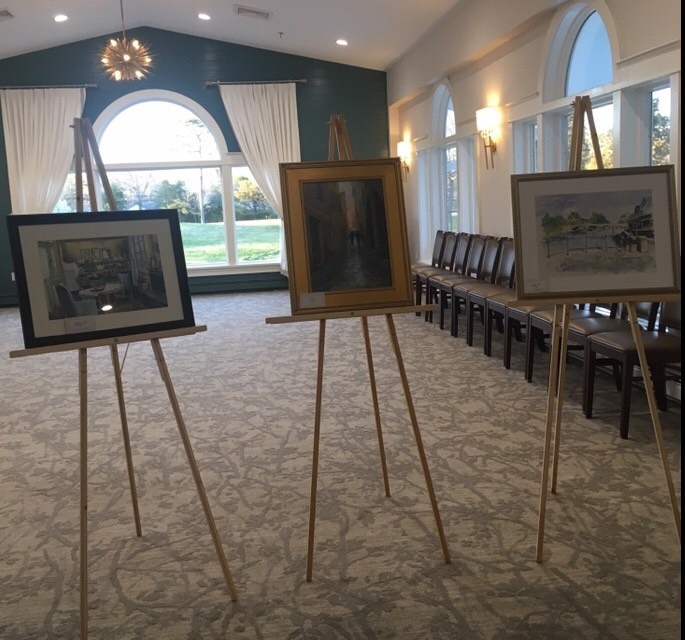 Their three paintings are part of a larger exhibition called Images par Trois Artistes that will be held Friday night, also at Greate Bay Country Club. The three paintings on display Wednesday night teased event-goers of what can be expected at the Images par Trois Artistes. Presenting poets Marya Parral, Belinda Manning, Eva Feeley, Wendy Kaplan and Raymond Tyler all read at the event. The presenters began with poems by some of their favorite French poets and finished their sets with their own poems as well. The featured poet of the night was Nigerian poet and musician, Echezonachukwu Nduka. Nduka read pieces from his book of poetry, “Chrysanthemums for Wide-eyed Ghosts.” Nduka also signed copies of his book at the end of the event. More information on April in Paris can be found at APRILinPARISsp.weebly.com.